Welcome to the Isaac Asimov Home Page. Here you'll find a comprehensive collection of resources pertaining to Isaac Asimov (1920-1992), the quintessential author, who in his lifetime wrote over 500 books that enlightened, entertained, and spanned the realm of human knowledge. The FAQ for the Usenet newsgroup alt.books.isaac-asimov provides answers to the frequently asked questions about Isaac Asimov, and is an excellent place to start if you have questions about him. Included is biographical information about both his personal life and his literary life, answers to questions about the Foundation and Robot series, and more. For a German translation of the FAQ, see Bálint Krizsán's site. Janet and Robyn Asimov, working with the American Museum of Natural History in New York City, established the Isaac Asimov Fund to support the annual Isaac Asimov Memorial Panel Debate as part of the Museum's Hayden Planetarium Programs. The sixteenth annual debate will take place at 7 PM on the evening of April 5, 2016 in the museum's LeFrak Theater. The topic of the 2016 debate will be "Is the Universe a Simulation? ", and will discuss the theoretical and experimental investigation of the concept that the universe is a computer simulation. Tickets for the event are on sale at the museum's web site, and a live stream will be available at amnh.org/live. The debate will once again moderated by Neil DeGrasse Tyson, the Frederick P. Rose Director of the Hayden Planetarium, host of StarTalk Radio and StarTalk Television, host of the 2014 television series Cosmos: A Space-Time Odyssey, and author of over 11 books on astronomy and science. David Chalmers, Professor of Philosophy, New York University. He has formulated the notion of the hard problem of consciousness, seeking to explain the subjective aspects of mental processes. He is author of Constructing the World and four other books concerning the philosophy of consciousness. Zohreh Davoudi, Theoretical physicist, Massachusetts Institute of Technology. Davoudi was the co-author of the paper "Constraints on the Universe as a Numerical Simulation", which outlines a possible method for experimentally detecting if the universe is actually a computer simulation by looking for anomalies characteristic of a simulation. James Gates, Professor of Physics at the University of Maryland. Gates is a string theorist and author of Superspace, or 1001 Lessons In Supersymmetry. In a previous Asimov Debate, Gates claimed that he found error correcting code buried within the mathematical equations of supersymmetry. This, he suggests, may be evidence that the universe is the product of a virtual-reality-generating computer network. Lisa Randall, Professor of Physics at Harvard University, is a researcher in the field of theoretical high energy physics, and is the most cited theoretical physicist in the last five years. She is the author of Dark Matter and the Dinosaurs and three other books on science. Max Tegmark, Cosmologist, Massachusetts Institute of Technology. His formulation of the Mathematical Universe Hypothesis states that mathematical structures must have a physical counterpart, and if they are complex enough, they will contain self-aware substructures that perceive themselves as existing in a real world. Each of the previous debates were presented to a standing-room only audience. Thanks to the many contributors, the Isaac Asimov Memorial Fund continues to grow. If you would like to participate in this extraordinary opportunity to perpetuate Isaac's memory and support the cause of science education, please read the details. An article from Rotunda, the newsletter of the American Museum of Natural History in New York City, profiles the career of Dr. Janet Jeppson Asimov, her involvement with the museum, and the establishment of the Isaac Asimov Memorial Fund. 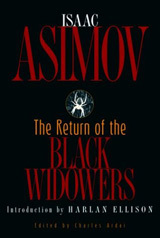 "Whereas the second week in April each year is designated as 'National Robotics Week', recognizing the accomplishments of Isaac Asimov, who immigrated to America, taught science, wrote science books for children and adults, first used the term robotics, developed the Three Laws of Robotics, and died in April, 1992: Now, therefore, be it resolved..."
The tribute to Asimov is due to the efforts of Paula Brooks, a robotics researcher and long-time fan of his who assisted the committee that wrote the resolution. A new collection of Isaac Asimov's Black Widower mystery stories was published by Carroll & Graf in November 2003. The Return of the Black Widowers features six stories that never appeared in a Black Widowers's collection, plus ten of the best previously collected Black Widower stories. It also includes an introduction by Asimov's close friend, author Harlan Ellison; a pastiche about the Black Widowers; and an essay by Asimov about how he came to write the Black Widowers stories. Also appearing in the collection is a new Black Widowers story, "The Last Story", written by Charles Ardai, the editor of the collection, for the December 2002 issue of Ellery Queen's Mystery Magazine, to commemorate the tenth anniversary of Asimov's death and the thirtieth anniversary of the publication of the first Black Widowers story. The Return of the Black Widowers can be purchased from amazon.com. 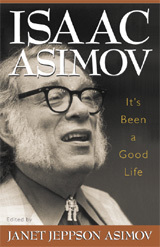 In late March, 2002, Prometheus Books published It's Been a Good Life, an autobiography edited by Janet Jeppson Asimov. The book was compiled from selections made from the three previous autobiographical volumes In Memory Yet Green (1979), In Joy Still Felt (1980), and I. Asimov: A Memoir (1994). The book also features "A Way of Thinking", Asimov's 400th essay for the Magazine of Fantasy and Science Fiction, which Janet put together from conversations they had and letters they had exchanged during many years of correspondence. In addition, there are excerpts from those letters sprinkled throughout the book. The result is a portrait of the life of Isaac Asimov, the writer, humanist, thinker, wit, and bon vivant, which lovingly illustrates why he was able to truthfully say "It's been a good life". The book also includes an epilogue in which Janet Jeppson Asimov reveals for the first time that Isaac's 1992 death from heart and kidney failure was a consequence of AIDS contracted from a transfusion of tainted blood during his December 1983 triple-bypass operation. She explains how and when he learned he had the disease, and why his doctors convinced him to keep it a secret from the public. The epilogue includes a description of Asimov's final days, together with some poignant passages that describe his views of life and death. The book can be purchased online from amazon.com or Barnes and Noble. Note: This file has been formatted for 132 columns. A chronology of events in Isaac Asimov's positronic robot and Foundation stories, compiled by Johnny Pez. There are many websites that offer books for sale, and of course the number grows each day. A number of those are good sources for books by Asimov, and a few are listed here. Please note that the listing of these sites do not constitute an endorsement of their services. Amazon.com Books: With millions of titles available, there is a good chance that you can find most of Asimov's books that are currently in print at Amazon. The Advanced Book Exchange represents large numbers of independent used book dealers, and is a good source for hard-to-find books. The Antiquarian Booksellers' Association of America offers out-of-print, collectible, and hard to find books. They are an association of booksellers who collectively sell books on the Internet. . Their selection of books by Asimov often includes a number of titles you may not have seen elsewhere. AddAll offers searching and price comparisons. Powell's Book Store is a large store in Oregon (reputed to be the largest bookstore west of the Mississippi) that has a website. The Science Fiction Book Club sells its own editions of some of Asimov's science fiction books at discount prices. And last, but not least, don't forget your local library as a source for borrowing books for reading. Prometheus Books published several of Asimov's essay collections. Random House, whose Spectra imprint publishes most of Asimov's science fiction titles that are currently in print. Doubleday (Doubleday Broadway Publishing Group, a division of Random House Inc.) has published more of Asimov's books than any other publisher. Gareth Stevens Publishing has published 50 of Asimov's books for young people on science, technology, and explorers. HarperCollins, published several of the more recent titles. HarperCollins UK, whose Voyager imprint includes a substantial number of Asimov's books published in the UK. Penguin Group published Asimov's books under several different imprints. Tor Books is publishing new hardcover editions of Asimov's science fiction novels. Their website provides information about their science fiction and fantasy books, and has links to other SF resources on the web. Houghton Mifflin Company has published 44 of Asimov's books, but there is no mention of him at their website. Jenkins' Spoiler-Laden Guide to Isaac Asimov is a collection of John Jenkins' reviews of every one of Isaac Asimov's books. Well, he hasn't actually reviewed all of Asimov's books yet, but he's working on it. John offers his views of what he likes and dislikes in Asimov's books from the point of view of a dedicated Asimov enthusiast, and provides a graphical rating system that neatly summarizes his evaluations for both the Asimov fan and the intended audience of each book. He has included reviews of Asimov's short fiction. John's opinions are highly personal, comprehensive, and clearly written, and definitely worth a look. He also has a blog of "random thoughts on one of the world's most prolific authors". Search the science fiction review archives of the Science Fiction Resource Guide to view their collection of reviews of Asimov's books. Isaac Asimov was born in Petrovichi, Russia, in 1920. Petrovichi is very proud of their native son, and have honored the place of his birth with a memorial stone. A picture was supplied by Alexander Azimov, who is almost certainly a relative of Isaac's. By March 18, 1941, Isaac Asimov had written thirty-one stories, sold seventeen, and fourteen had been published. At that time, he considered himself nothing more than a third-rate writer. That evening, he sat down to write his thirty-second story, based on an idea suggested by Astounding editor John W. Campbell the day before. By April 8, he finished the story, titled "Nightfall", and on April 9 he took it to Campbell. Two days later, he received this letter from Campbell, and the history of science fiction was changed forever. Science Fiction writer Michael A. Burstein pays homage to Isaac in Cosmic Corkscrew, his Hugo Award nominated story which appeared in the June 1998 issue of Analog, and honors the 60th anniversary of Asimov's submission of his first story to Astounding Science Fiction. Mike Brummond's scholarly essay Religion in Asimov's Writings considers the aspects of religion that appear in Asimov's fiction, and Asimov's views on religion, as expressed in his nonfiction. Asimov's Science Fiction Magazine has a website containing feature articles, excerpts from upcoming issues, book reviews, online interviews, reprints of Isaac Asimov's editorials, and much more. Home to Isaac Asimov's monthly science column for over thirty-three years, The Magazine of Fantasy & Science Fiction, founded in 1949, is the award-winning SF magazine which is the original publisher of SF classics like Stephen King's Dark Tower , Daniel Keyes's "Flowers for Algernon" and Walter M. Miller's A Canticle for Leibowitz . The website has selections from recent and upcoming issues, current issue contents, writer's guidelines, and subscription information. The Encyclopedia Galactica is the ultimate reference work for the universe detailed in Isaac Asimov's robot, Galactic Empire, and Foundation stories. Providing information on people, chronology, robotics, and other topics, it is published by the Encyclopedia Galactic Publishing Co., via the efforts of Mike Carlin of Bristol, England. The Imperial Galaxy, a gallery of original artwork illustrating the Foundation universe, brought to us by Slawek Wojtowicz. In the early sixties, Asimov regularly contributed book reviews to The Horn Book, a children's literary review journal, who marked their 75th anniversary in October 1999. At their virtual history exhibit is a letter from Asimov to an editor at Horn Book, after he received an unexpectedly large payment, asking to make sure that he wasn't overpaid. The Life & Times section of the New York Times website also features articles by and about Asimov, as well as reviews of Asimov's books that appeared in the Times (registration required). Science Fiction writer Michael A. Burstein, winner of the 1997 John Campbell Award for Best New Writer, remembers Isaac Asimov in "Asimov and Me", first published in the Fanzine Mimosa in December 1997. A 1988 interview with Asimov by Slawek Wojtowicz, a science fiction fan from Poland. The transcript of a lecture by Asimov on the future of humanity. An obituary for Isaac that appeared in Newsday . A chronology of Asimov's Susan Calvin stories, robot novels, galactic empire novels and Foundation series. An essay by Robert J. Sawyer on why the Three Laws of Robotics aren't used in the real world. The Science Fiction resource guide offers links to a multitude of science fiction resources on the net. The Index to Science Fiction Anthologies and Collections, Combined Edition by William Contento should help you find an enormous number of science fiction stories and anthologies published before 1984, and Science Fiction, Fantasy, & Horror: 1984-1998 covers everything since then. Blastr, a professional electronic publication of science fiction news and reviews.